Who should draw NH political boundaries – people or algorithms? 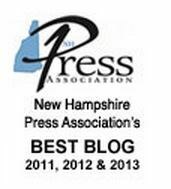 As the Concord Monitor reports today, there’s a new push to have an impartial group of people, rather than the political party in power, draw legislative boundaries in New Hampshire. Similar pushes are being made around the country in response to concern about gerrymandering. Here’s another idea: Use more mathematics to draw the boundaries. The course was a huge hit, and Duchin has become quite well known in this matter, testifying in various court cases about redistricting and getting national attention. You can see one of her lectures on YouTube. Inspired by all this, last year there was a bill that would have applied a process known as efficiency gap analysis statewide districts in New Hampshire after the next redistricting in 2021. 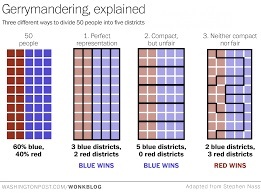 If the analysis finds problems, “the redistricting for that elected body shall be deemed to be gerrymandered and therefore not valid” and the districts would be redrawn before the next election. (Here’s my story about it) The bill was killed by a committee, but it’s interesting that it came up at all. I’m looking forward to seeing how much math arises in such a political topic this year.